Who is responsible for the repairs? Many times there is ambiguity regarding the responsibilities of both the tenant and the landlord over repairs to the rental property. While the legal aspect of this can vary from state to state, here are some basic guidelines regarding the tenant’s responsibility to request the repairs, and the landlord’s obligation to honor those requests. Typically there are two types of repairs – those that affect the health or safety of the tenant, and repairs for any other reason. For example a non-functioning dishwasher doesn’t affect the safety of a renter, but a light fixture that is sparking certainly does. Your landlord must provide a dwelling for you that is safe and sanitary, provides hot water, has smoke detectors, has locks on the doors, and basic heating and toilet facilities. What Is Your Landlord Responsible For? Don't let your landlord put their responsibilities on you! 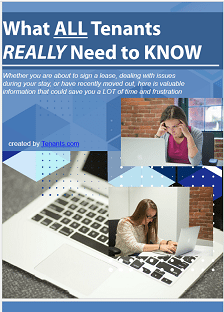 Get our free book "What ALL Tenants REALLY Need to KNOW" and find out exactly what you are responsible for and what you aren't. Many times, renters and tenants are wrongly given responsibility for things that the Landlord should be responsible for. Find out your rights now by downloading below. 1. Request the repair in writing – you may need later proof of the date that you requested the repair, in case it is not performed in time, or if there are bad consequences as a result of negligence. Keep copies of these requests in a safe place. You may want to request the repair in a certified letter if it is something critical. An email is not enough to prove that the request was received. However, if the repair is not a health or safety issue, sending a certified letter initially might be considered overkill. 2. Make sure your rent is paid. It is not acceptable for you to withhold rent in order to facilitate a repair, and you could end up being evicted as a result. 3. Keep receipts. If you have to spend any money to make an immediately needed repair, keep your receipts, and document exactly what was done. 4. If the repair is needed because of damaged caused under an insurance claim (a causality loss for hail, smoke or fire), the landlord may not be obligated to make the repair until the insurance company sends the proceeds to the landlord. In this case you may be able to negotiate a rent reduction or alternative living quarters. 5. Be sure to take photographs of the work that needs to be done, and document everything. You might want to include a date/time stamp (such as a newspaper with a date) as some courts may not accept the built-in time stamp from digital cameras (since they can be altered). 6. Before you move in, check that everything is operational, including the thermostat, ventilation in the bathroom and kitchen, faucets and tub, lighting, the hot water heater, and be sure there are no leaks. Following these suggestions might save you a big headache later, and make your stay much more enjoyable.